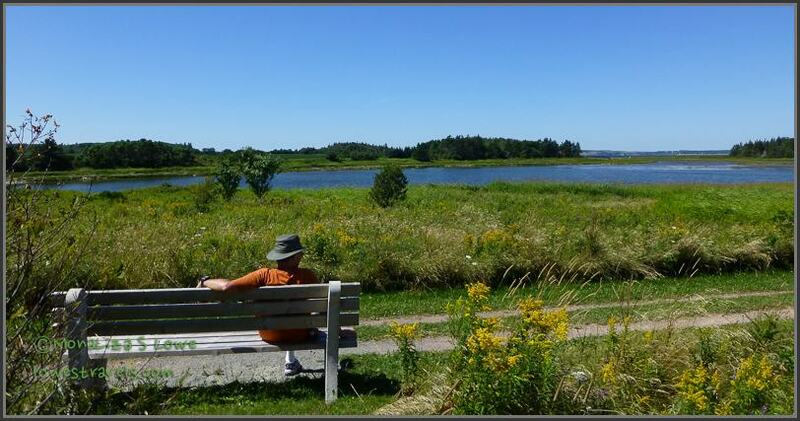 Prince Edward Island (PEI) isn’t just all pastoral landscapes and gleaming harbors. The island is also famous for being the home of Anne of Green Gables, and I vaguely remember the tv series from decades ago. However, since I wasn’t a fan we skipped a trip to the Green Gables National Historic Site. 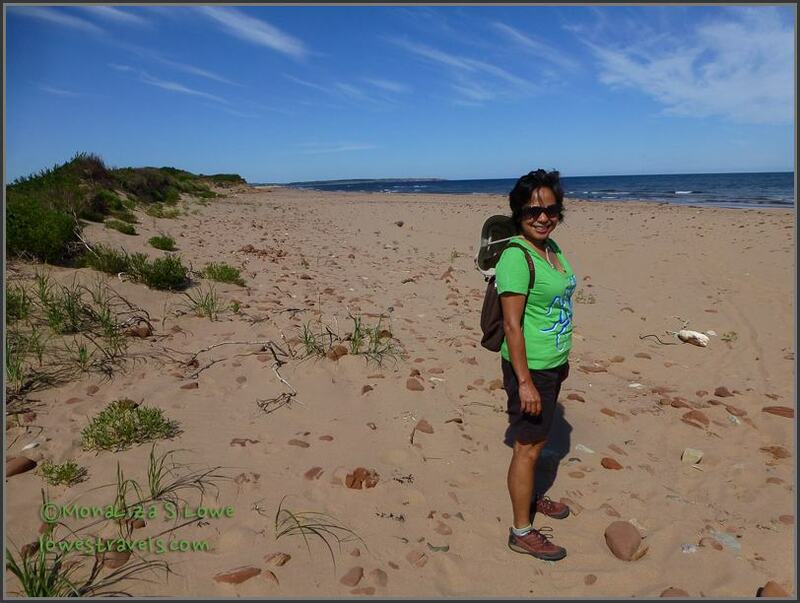 Fortunately, our base camp at Cavendish was only five minutes away from PEI National Park. As always, we did what we do whenever we get a chance – hike and bike. On our first full day we hiked one of the trails which took us through several micro-environments. 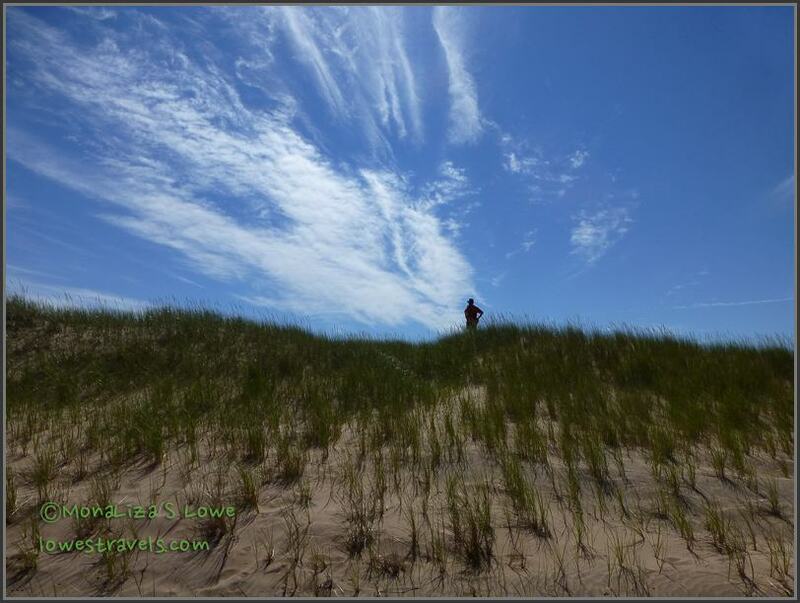 Starting off toward the dunes along beautiful Cavendish Beach. He made it! I’m down on the beach already. After a while the trail took us out into a wetlands area. 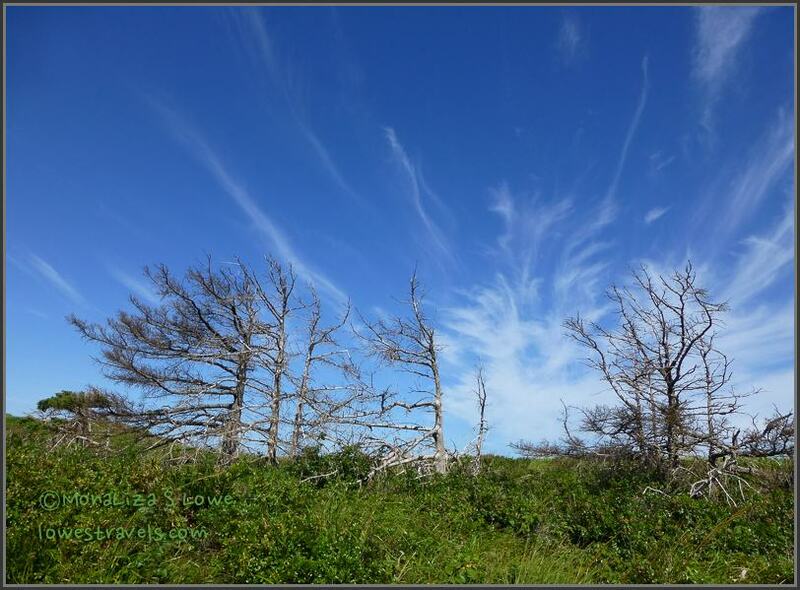 The clouds seemed to mimic the outline of the trees. A good looking Merlin checked us out from above. 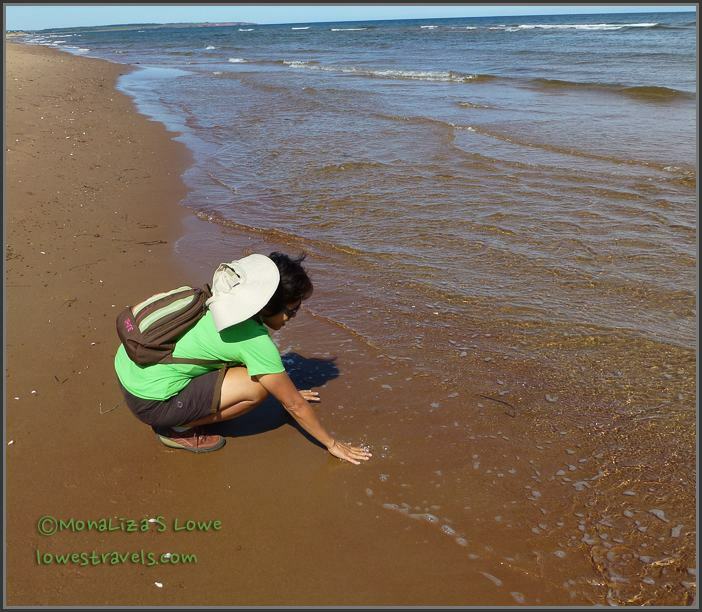 We finally ended up at a red beach where I touched the warm waters of the Gulf of St. Lawrence. 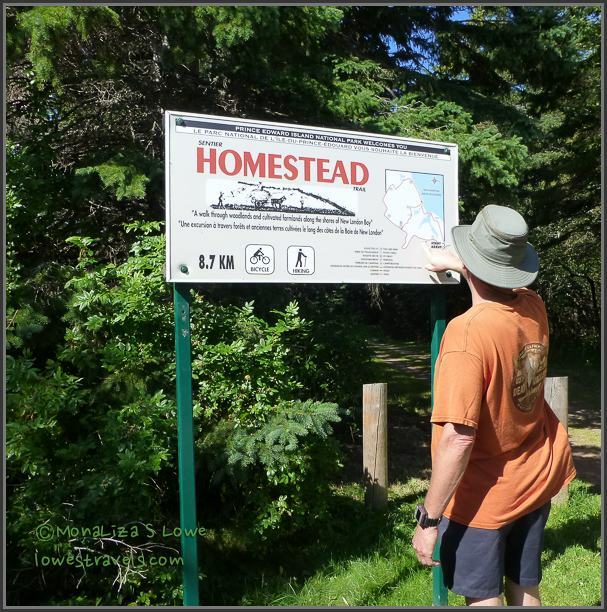 Next we headed back inland and followed the Homestead Trail. 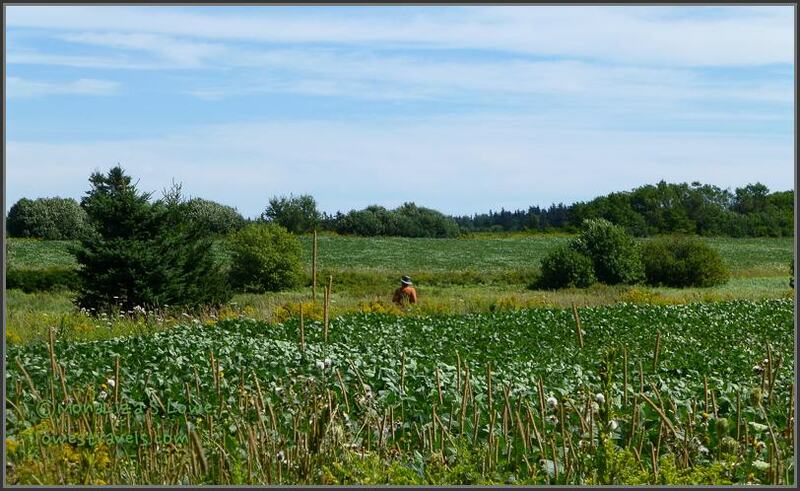 This one passed through lush forests and rolling farmland along the beautiful shores of New London Bay. 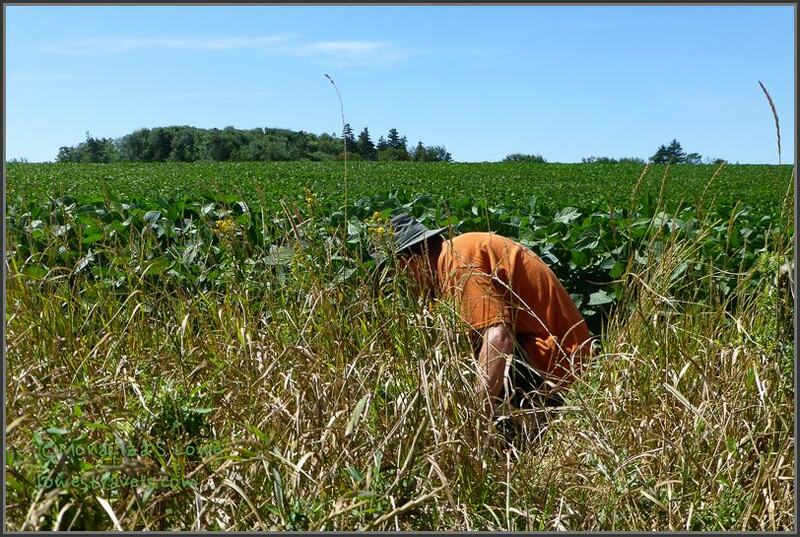 What crop is this? We never figured it out. The sun was already high over our heads so there were no shady spots to rest on this section, but at every turn we were faced with meadows of pretty colorful wildflowers. Not a bad way to spend a Tuesday afternoon! 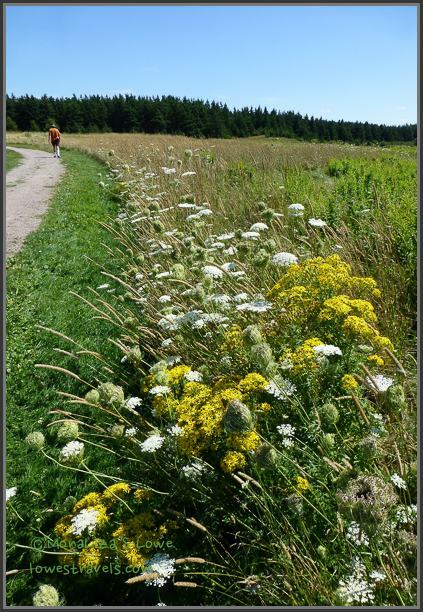 Yellow and white – just right! Is he lost? Does he care? A hint that summer is almost over. 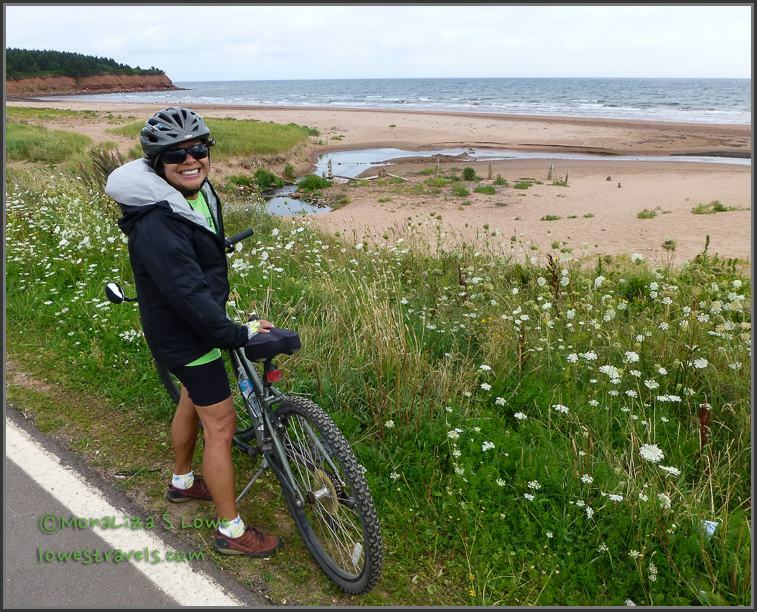 On another day we took our bikes and followed the coastline of PEI fronting the Gulf of St. Lawrence. 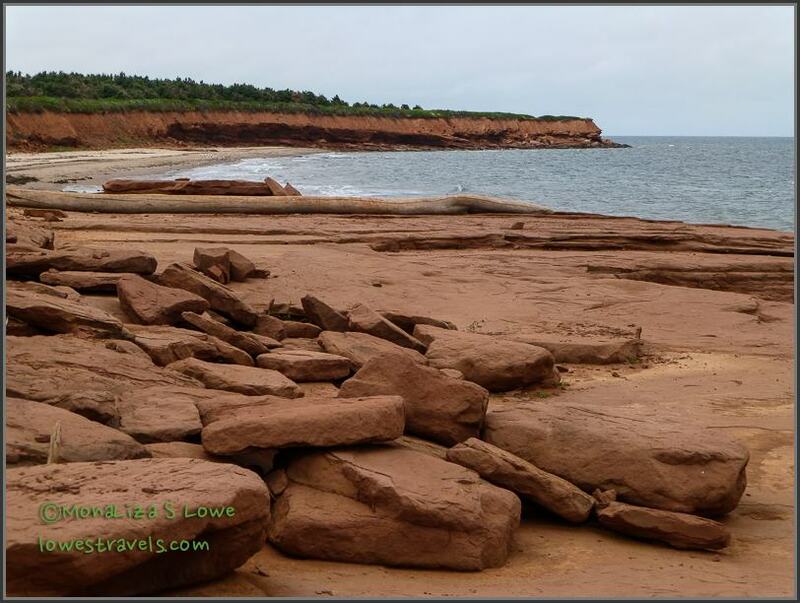 The soil on PEI is a deep red, so the dramatic rocks and cliffs around the coast reflect this, while the sand on the beaches is white. It makes for a stunning coastline. There were many areas of reddish sandstone like this one. Why is this woman so happy? Could it be the wildflowers, the birds, the beach? Maybe all of the above? 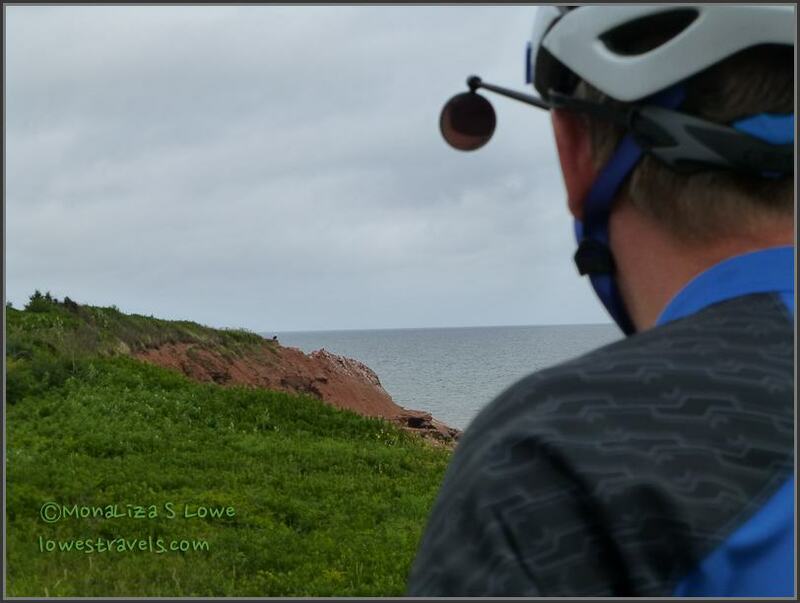 Steve spotted something way out at the end of the rocks – is that a bird ? After getting closer – yup, it’s a Bald Eagle! 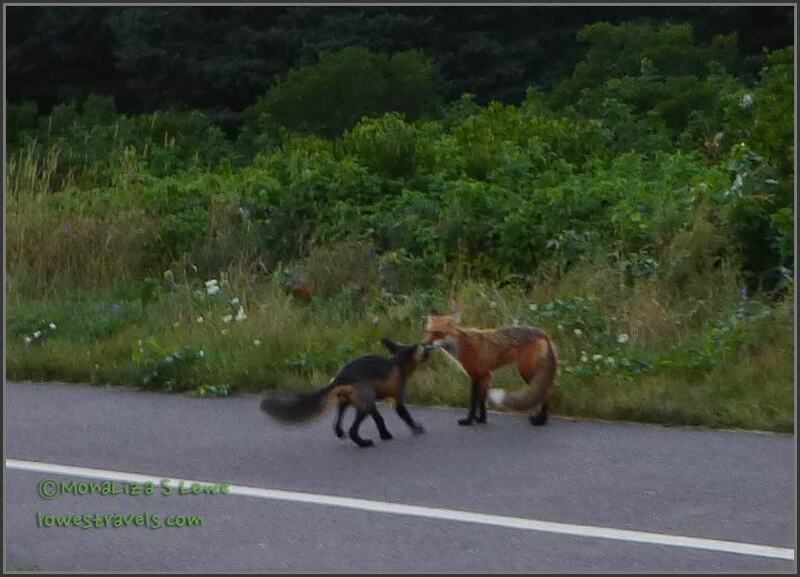 Several foxes strutted along the road causing a traffic jam. 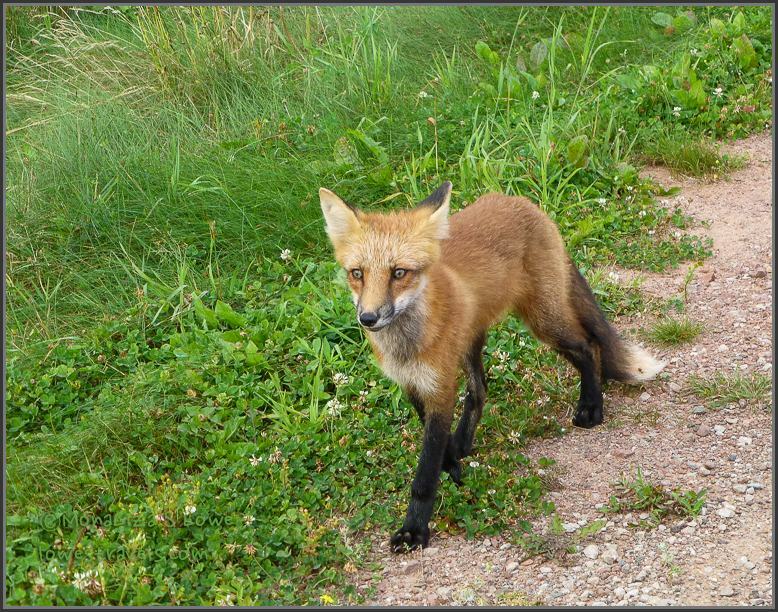 Red fox trotting along the road. The day finally ended with another gorgeous sunset over the island. Gulf of St. Lawrence glowed orange in the sunset. Great wildlife sightings and photos. Love the merlin! Nice wildlife shots, love the merlin! I don’t know how you two have time to download photos and write your blog! It’s great to travel with you. Beautiful pictures again and wonderful wildlife shots. 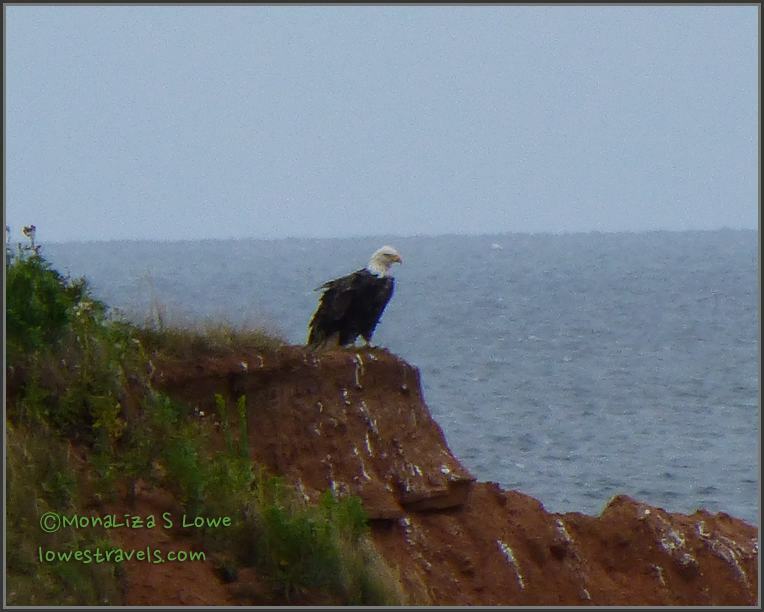 A bald eagle to add to your bird photos…..jealous! What pretty country and another great job capturing. Won’t be long and the leaves will be turning. 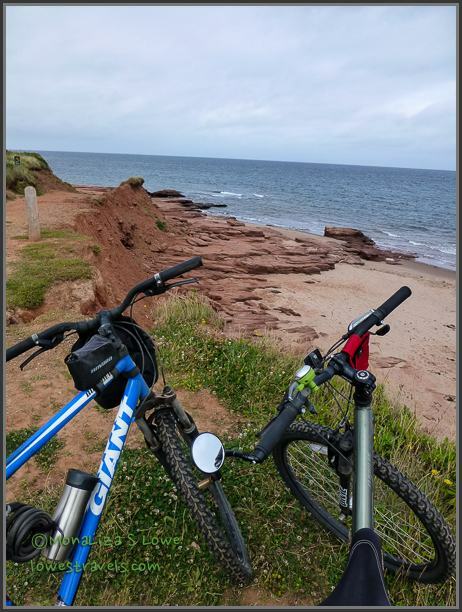 What an amazing post…you have captured all the beauty of PEI. 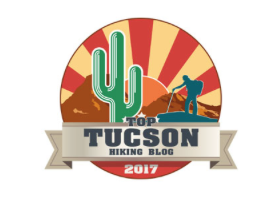 Sure makes me want to go back there and do some hiking! The sunset is spectacular! 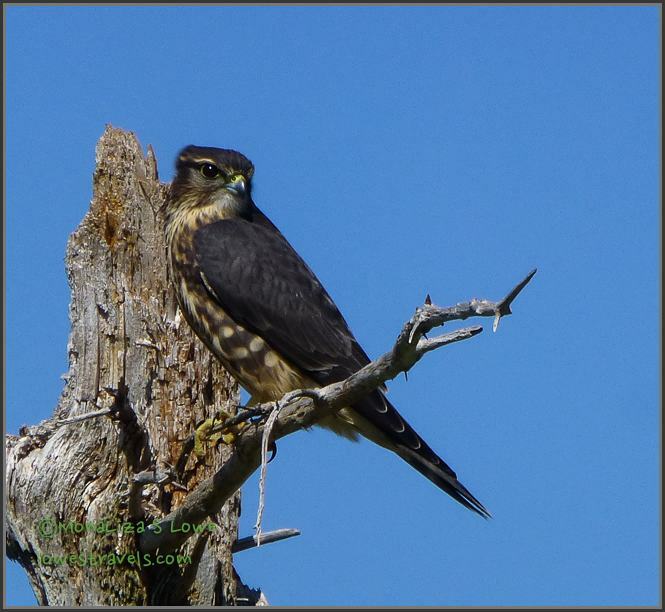 Can’t wait to read about and see your adventures on Cape Breton…..
Oh so it is a Merlin not a Falcon. Thanks for the catch and I just updated it. I love the fox, bald eagle, nature photos. 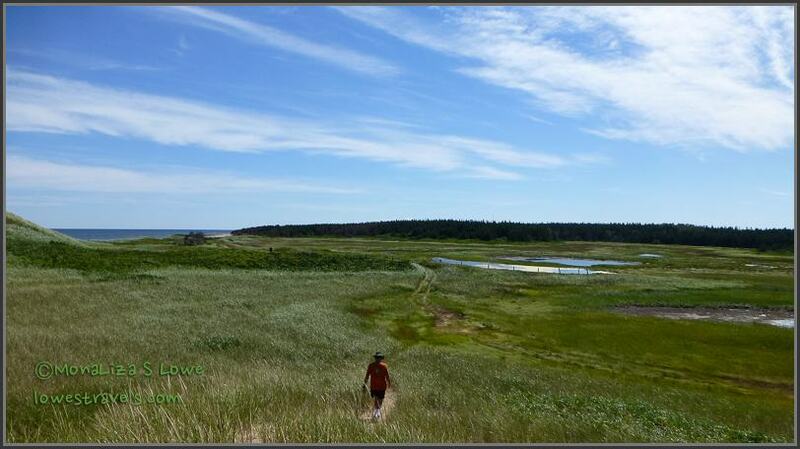 Prince Edward sure is a beautiful island to hike and bike around. You are so lucky to be in such a beautiful place. 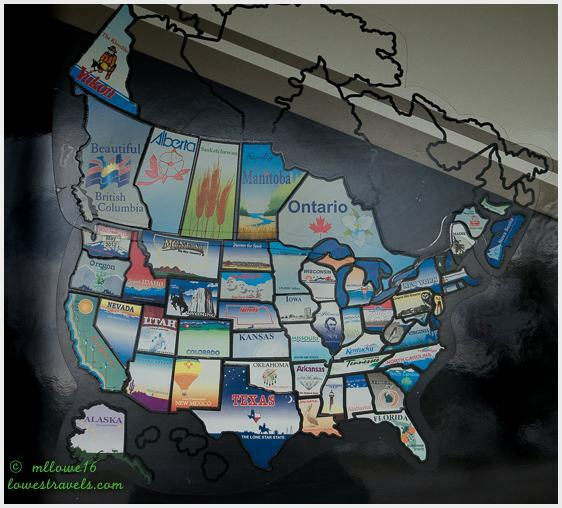 You could make a photo and travel book with all the great photos you have taken. Happy trails! I’m going hiking today in the Redwoods. You always have great photos and this time has got to be some of the best. WOW great animal shots! Looks like you’re in sensory overload mode! I know I would be!